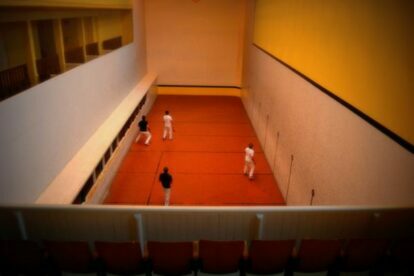 Trinquet de la Cavalerie – Sport on the 6th floor! Near the Eiffel tower stands a grandiose art deco car park. Even more impressive than its exterior though is the fact that hidden away on its 6th floor is an unexpected Basque pelota trinquet. Access is via a rather rickety old and tiny lift that drops you off at the entrance (which is shared with a private tennis club – there is also a fantastic tennis court in a wooden hall up here). You can drink up the atmosphere by sitting and watching a game from the seats that dominate the court, and you can even literally drink the atmosphere in the small members’ bar. Previously there was also a large restaurant here – which is currently closed, but you can wander around the 6th floor terrace which gives a spectacular view on to the Eiffel tower.